 The ESI Cordless Handset II from Action CTI provides its user most of the rich ESI feature set along with the convenience of a portable device. Like the original ESI Cordless Handset models, each ESI Cordless Handset II provides its user most of the rich ESI feature set along with the convenience of a portable device. The ESI Cordless Handset II from Action CTI uses advanced DECT 6.0 third-generation 1.9 GHz technology to provide mobility to the user who’s constantly on the move in the office. Like the original ESI Cordless Handset models, each ESI Cordless Handset II provides its user most of the rich ESI feature set along with the convenience of a portable device — with the added benefit of increased range of use, thanks to DECT’s ability to support repeaters. This lets users continue calls while moving between different coverage cells throughout a location, using a process known as handoff that’s similar to how cell phones work. When you return to your desk, a touch of ESI’s Quick Switch™ Key lets you toggle from the lightweight, portable Cordless Handset II back to your full-function ESI desktop phone. Provides local IP telephony (i.e., LAN-only). Uses G.711 voice compression. The base station uses Power over Ethernet, to maximize your connection convenience. Works from a broadband-equipped remote location (such as your home or a small satellite office) just as if it were on the regular phone system at your main office. Uses G.726 voice compression. The base station uses Power over Ethernet, to maximize your connection convenience. Under DECT 6.0, each ESI Cordless Handset II operates on the 1.9 GHz frequency band, which has been specially allocated to support cordless telephony. 1. Availability of IP capabilities determined by system configuration. 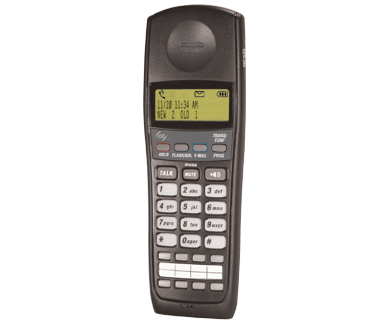 IP-enabled legacy ESI systems use different IP desktop phones for local and remote applications. 2. Power over Ethernet provides power for all IP versions of the ESI Cordless Handset II. In an environment where PoE is not available, a PoE adapter must be used.